Dan Fitch picks his Celebrity Ryder Cup teams. The curly-haired jazz saxophonist has the best handicap of any celebrity golfer, playing off +0.6. He still thinks that he can get better: "With the sax, I learned technique well enough so that it feels like part of my body, and I just express myself. That's where I want to get in golf." A veteran of Melrose Place and several other soap operas, Jack Wagner turned to acting having been rejected for a golf scholarship. He won the 2006 American Century Celebrity Golf and has been victorious in several club championships at his home course at Bel-Air Country Club. Dennis Quaid was once named as the top Hollywood golfer by Golf Digest and now plays off scratch. He hosts the Dennis Quaid Charity Golf Tournament and has recently expressed his regret at turning down a part in Kevin Costner's golf movie Tin Cup. Nelson made his name as an actor in the Poltergeist movies and the sitcom Coach, but his real passion is for golf. A regular on the pro-celebrity circuit, Nelson plays off 5 and hosts the Craig T. Nelson golf classic. After a distinguished baseball career that saw him play for the LA Dodgers and New York Yankees amongst others, Rick Rhoden launched a second sporting career in golf, after retiring from pitching in 1989. He has won the American Century Celebrity Golf Classic on eight occasions, is a dominant player on the Celebrity Players Tour and qualified for the United States Senior Open. The veteran rocker plays golf six days a week and has credited the sport in helping him overcome his addiction to alcohol. Cooper, plans his tours around his golfing schedule, named his autobiography 'Golf Monster' and plays off a 5.3 handicap. 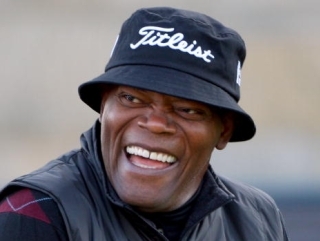 The Pulp Fiction star Samuel L. Jackson is so commited to playing golf that he has a clause written in to all his movie contracts, allowing him to play golf during production. He describes the golf course as: "the only place where I can go dressed as a pimp and fit in perfectly." Billy Crudup is known for being extremely selective about what films he stars in. Part of the reason for that is his love of golf. Crudrup plays off 4.5 and is a regular at plays at Bayonne golf club, near Manhattan. With a handicap of 7 and a member at the exclusive Sunningdale golf club, Hugh Grant takes his golf seriously. He is scornful when it comes to the supposed handicaps of celebrity golfers: "I once played with Dennis Quaid, who's very good. He plays off 1. Although it's what they call a Hollywood 1. It actually translates to about 12 here!" Like Hugh Grant, the British tennis star Tim Henman is a member at Sunningdale. Since retiring from tennis, Henman plays golf every weekday and managed to reduce his handicap to scratch. One look at Lloyd Cole's tour schedule will show that he mainly plays concerts in towns suspiciously close to famous golf courses. Playing off a handicap of 5.3, the singer songwriter fell in love with the sport as a teenager, when his parents ran the Chapel-en-le-Frith golf club. The veteran entertainer Bruce Forsyth has chosen the Wentworth Estate as his main residence, due to it's proximity to the famous Wentworth golf course. Playing at least three times a week, Forstyth still has a handicap of 12 despite being 82 years old. Most school PE lessons consist of football or cross country running, but having attended the exclusive Eton College, Band Of Brothers star Damian Lewis was able to play golf. Lewis now plays off a handicap of 12. In 1981 the Irish broadcaster set the world record for the longest successful golf putt ever televised, with an effort from 33 yards at Gleneagles in a pro-celebrity tournament. The Czech tennis star of the eighties, concentrated on his golf after handing up his racket. He now plays off scratch, has competed in five professional tournaments and has attempted to qualify for the US Open. Lendl has five daughters and is so committed to their golfing, that the whole family moved so they could enrol in the David Leadbetter Golf Academy. The Scottish film and TV actor plays off a handicap of 6, having been taught by his father as a child. Scott now hosts his own celebrity golf tournament which raises money for the charity Leuka. Betting.Betfair will keep you up to date with all the latest Ryder Cup Betting news throughout September and the tournament itself at the start of October. To join Betfair today and take advantage of our £25 Free Bet offer simply click here and sign-up for a Betfair account and your account will be active within a couple of minutes. Each friend you introduce to betfair can earn you between £25 and £50.